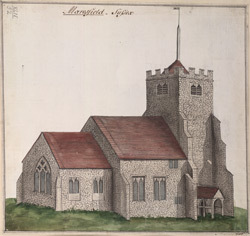 St Bartholomew's church was originally a Norman building, but few Norman features remained at the time of this image, except for the windows and possibly the north doorway. The west tower is in the fashionable, rectilinear Gothic Perpendicular style. The parish of Maresfield is large and included the villages of Nutley and Fairwarp until the 1800s.